Comment Two into one does go. Starting from its mid-range AMS array, Hitachi is developing a unified block and file storage platform using VSP microcode and storage function heads layered on top. This fills out the picture drawn in a previous HDS common storage platform story. 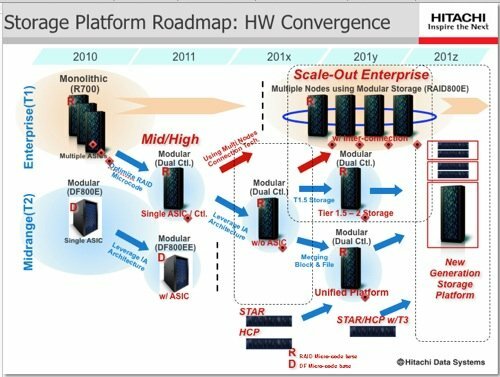 There are four stages to this development, as shown on an HDS Storage Platform Roadmap: HW Convergence PowerPoint slide. Stage one, taking place this year, involves the monolithic VSP, described as the R700 with multiple ASICs and a mid-range RAID micro-code (firmware) base. A low-end version of this is created. It is a modular dual controller design, with one ASIC per controller and optimised RAID micro-code. Simultaneously the modular AMS array, described as the DF800E, with a single ASIC and a DF micro-code base, leverages Intel architecture to become the modular DF800EE, retaining the ASIC and the DF Micro-code base. The second stage takes place after 2011, in a year shown as 201x. The tier 1 enterprise storage R700 line continues, but we see the dropping of the DF800EE product with its DF micro-code base. The modular dual controller product, the one with the RAID micro-code base, is developed again, losing its ASIC, and leverages - that word again - the Intel architecture, while still using the RAID micro-code. The slide shows a HCP (Hitachi Content Platform) system and something called STAR below this at this point. We're trying to find out what STAR is. Stage three follows on, with the year described as 201y - HDS really doesn't want to be pinned down on actual years. The modular, dual controller system morphs into two systems: a tier 1.5 to 2 storage product and a separate unified platform that merges block and file storage. The STAR and the HCP systems or functions are shown migrating onto or into this box. At the high end there is now a scale-out enterprise product, formed from multiple RAID800E modular storage nodes with multi-node inter-connection technology. The VSP as we know it is presumably is end-of-lifed. Stage four happens in 201z and has the RAID800E continuing as the high-end product. Below that is a single new generation storage platform for the low end of the enterprise array area and the mid-range area, also identified on the slide as being for tier 1.5, 2 and 3 storage. It has STAR and HCP systems layered on top in the slide, and uses a STAR/HCP system for tier 3 storage functions - we're guessing this is an on-line archive.